On all serious notes, As soon as I heard about “The Polished Man” Campaign, I knew I had to interview Elliot. He is Globally, yes, Globally raising awareness to help end Child Abuse. Which many of you know hits home for me. In case you haven’t heard “MY STORY” yet, I’m a victim of child molestation. Sadly, the fact is that 1out of 5 children, GLOBALLY, will at some point fall prey to such abuse. This is a horrible!!! WHY????? I believe it’s because no one talks about it. It’s that simple. So…. I’m on a mission, myself, to help raise awareness. WE MUST TALK ABOUT IT!!!! MUST!!! I asked Elliot how he came up with the name for “The Polished Man” campaign and his answer was heartbreaking. He met a girl, a couple years ago, named Thea, in Cambodia. And even though there was a language barrier between the two, Thea took a marker and polished all his fingernails and drew a small heart on his hand. Elliot inquired about her story and found out that she had been raped and molested for 2 years at a supposed safe house. As you are imagining right now, he felt sad for her. When he arrived home, from meeting Thea, he decided he was going to leave one of his fingernail’s polished to help him remember her. This has such huge significance because of the statistic I shared with you earlier… 1 out of 5 children are abused sexually or physically. During his interview, Elliot mentioned several times about why he is challenging men to polish one fingernail. He said the 90% of perpetrators are men, so he wanted to challenge their masculinity. At first he says that people questioned him when they saw he had only one nail polished; but when they heard of the reason why he was doing it, word quickly spread. Elliot clearly has a high standard when it comes to men leading. I’m not writing this just so you know the statistics and think really sad thoughts and say that’s unfortunate; And I certainly didn’t do the interview for those reason either. The fact is, if you just read about it or just listen to this episode, awareness will not take place unless we TALK about it. That means, almost every family is affected. The topic of child abuse has been pushed under the rug for far too long. WHY?? That’s the BIG question…. My theory, People are more concerned about their families reputation than the child’s. Heart wrenching, I know. But it’s the sad truth. Did you know that child abuse is a learned behavior??? It’s time to BREAK the chains, and BREAK the cycle. I have spoken with many people who have been a victim and they are still ashamed to talk about it or tell their family and even their spouses. IF, you are a victim and feel the same, grab these words…. “IT’S NOT YOUR FAULT. Feeling ashamed is a lie you are telling yourself. I know this all too well. GOD did not give us a spirit of fear but of power…. 2 Timothy 1:7. YOU HAVE THE POWER TO SPEAK UP!! I told Elliot that he is a HERO to me for helping raise awareness for Child abuse, and he told me that I was the HERO for speaking up. I think we BOTH are. The more voices that join together for the same cause, the louder we are heard. I would really love to hear feed back from you all. I hope that Life in Purple isn’t just noise in the background, but making a difference in people’s lives. It’s time to Rise LIPTalk Nation and FIGHT together to end ALL abuse. We are called to LOVE people, not HURT people. SOOO many of us need to heal. SPREAD the word. I don’t like begging, but on this matter, I think it’s necessary. PLEASE!!! 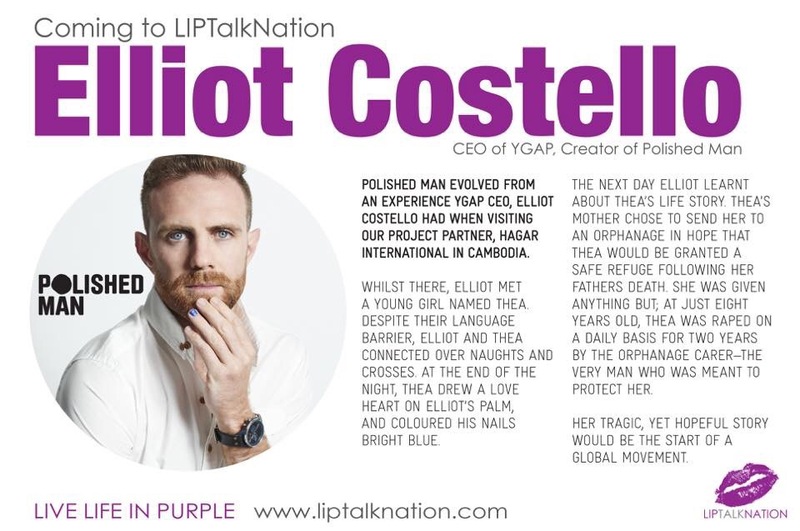 To find out more about Elliot and what else he is doing go to www.polishedman.com or YGAP.com.au I love that Elliot is living a Life in Purple.